Go here to post the video or post the text as a comment here or on the FaceBook group. Things have been a bit hectic at work, so I haven’t had a chance to record many submissions for #TicckleTuesday. However, I’m taking over editing of a board games podcast soon, and wondered whether that format might be a good one for audio versions of flash fiction. Please comment below and tell me what you think. I think podcast is a great idea. A lone cactus spurned him. He chose to ignore its prickly insults and trudged on towards the cloudy mountain top. The mountain teased him with changing colors and tortured him with fiery dust storms. At the end of the day, the mountain yielded and welcomed him with evening skies that reflected in the gold hidden in the mountain peaks. 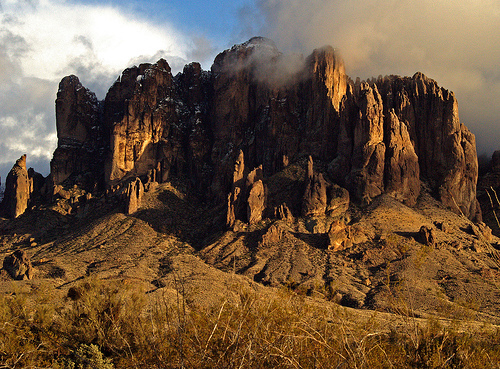 No one remembers seeing him leave the Superstition Mountain.